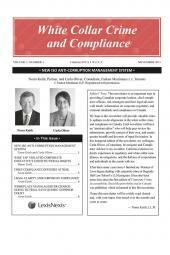 Written by Norm Keith, LL.M., rated by Lexpert as the most frequently referred lawyer in Canada for occupational health and safety and related regulatory and corporate crime matters, this book takes you systematically through the details, case law interpretation and implications of the "Westray Bill" as well the crime of workplace manslaughter. It has been 15 years since Bill C-45 was passed into law. Bill C-45 was a Criminal Code amendment that created the indictable offence of occupational health and safety (OHS) negligence. Norm Keith, a partner in a leading Canadian national law firm and a renowned, international expert on OHS issues, wrote the first in-depth analysis of Bill C-45, and its implications for workplace health and safety practices, in the book's 2004 second edition, then updated in the book’s 2014 third edition. In this fourth edition, the author reviews 15 years of all the cases that have been prosecuted under this legislation. A new chapter on manslaughter in the workplace - A completely new chapter is introduced dealing with the crime of manslaughter in the workplace. The Fournier case resulted in the conviction of an individual for manslaughter arising from a workplace fatality. While one case cannot be reasonably described as a trend, the use of this crime in the context of a workplace fatality, is an important development in the law. Norman A. Keith, B.A. (Econ. ), J.D., LL.M., CRSP, is a senior partner at Fasken Martineau DuMoulin LLP and leads the national Occupational Health and Safety and Workers’ Compensation practice. Mr. Keith is a co-founder of his firm’s White Collar and Business Crimes practice group. He has successfully defended over 1,000 charges under OHS, EPA, criminal and regulatory offences across Canada. He represents corporate defendants, employers, directors, officers and managers at administrative tribunals, coroner’s inquests and courts up to and including the Supreme Court of Canada. Mr. Keith has assisted clients in a wide range of industries, including the construction and infrastructure, manufacturing, energy, real estate and development, health care, nuclear, transportation, aviation, mining and mining plants, and retail sectors. He is a frequent speaker at national and international conferences. He is the author of 12 books and hundreds of trade and peer reviewed journal articles. Lexpert has rated Mr. Keith as the most frequently referred lawyer in Ontario for Occupational Health and Safety law matters. He is also recognized in The Best Lawyers in Canada as a leader in his fields. Mr. Keith was called to the Ontario Bar in 1983 and was the first practising lawyer in Canada to receive his Canadian Registered Safety Professional designation in 1998. He is an International Bar Association committee member for White Collar and Business Crime, an American Bar Association White Collar Crime committee member representing Canada, and a member of the Canadian Bar Association Anti-Corruption committee.